The world's largest broadcast technology conference, IBC (International Broadcast Conference), wrapped up recently, where more than a dozen halls were packed with cameras, production gear, set-top boxes, satellite uplink kits, and much more. The conference kicked off with a real spoiler: a demonstration from Japanese broadcaster NHK of Super Hi-Vision, an ultra high definition TV format it's tipping for home use in the 2020s - in Japan at least. IBC visitors first experienced these lifelike 7680x4320 pixel images and 22.2 three-dimensional surround sound two years ago, but it's now a truly global project, with prominent input from the BBC Research and Innovation among others. This demo was a double world first, with the first live outside broadcast and the first ever satellite transmission. SHV has more than 16 times the detail of 1080p Full HD, so BBC R&I chief Erik Huggers looked like he could step out of the seven-metre screen from City Hall in London, where one of NHK's two SHV cameras and a bizarre-looking 3D microphone had been placed. Even compressed for the fibre link across the North Sea, SHV needs more than 30 times as much capacity as a regular HD signal, but that's something the BBC is working on with a special version of its Dirac compression system. SHV could find its way to the British public very soon: the BBC wants to use giant outdoor screens all over the country so the public can watch the 2012 Olympics in Super Hi-Vision. Auntie Beeb's boffins also had an answer to the 200Hz TVs shown off at last month's IFA consumer electronics show in Berlin. Instead of using electronic trickery to smooth out conventional 50Hz video, the BBC engineers have been using a high frame rate camera designed to catch sports in slow-motion, and filming at 300 frames per second, then downconverting it to 100fps. On a 100Hz TV, the result is almost perfectly smooth video, with neither motion blur nor the processing artefacts normally found on 100Hz displays. The drawbacks? Very expensive cameras and you need twice as much storage. Every level of extra detail, whether it's depth or just more pixels, adds more information, so you end up with a bigger signal to transmit. The big news in broadcasting at IBC was the first demonstration of the new DVB-T2 system outside the UK - and only the second time it's been used anywhere in the world. DVB-T2 will enable Freeview to host three HD channels by the end of next year, and once again the BBC has been leading the way. 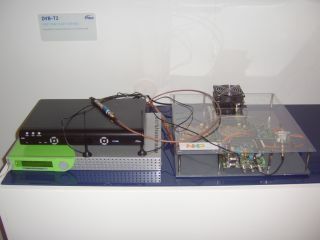 A transmitter on the DVB group's stand, built by BBC R&I, broadcast a three-channel hi-def multiplex around IBC, although the only receiver able to pick it up was a prototype on Pace's stand about 150 metres away. The transmission kit was been put together in just three months from the DVB deciding the T2 spec, and they're already confident it will increase capacity by 50 per cent compared to the basic DVB-T format used for Freeview. Pace is almost certain to be one of the first DVB-T2 box providers, following its work with NXP on this project. It was a huge achievement to have a working receiver at this stage, and bodes well for the future. Great TV also needs a friendly interface. A good port of call at IBC is always NDS, the company which provides much of the underlying technology for Sky, from the EPG to Sky+. On NDS's main stand was PC Plex, which turns your PC into a Sky+HD using a compact USB satellite receiver, with a viewing card reader for security. The demo had a very familiar-looking TV guide, but it could also connect to online on-demand services, or network with other set-top boxes in the home. A personal invitation also won us a look at Infinite TV, the name for a set of next-generation TV concepts. The hour-long presentation looked ahead to a world of viewers using handheld and set-top devices to consume TV from online and broadcast. The killer concept is that some people are worth more to advertisers than others, so a high-earning, big-spending young man might get to watch a free film - gift-wrapped in the appropriate advertising - that less desirable viewers would have to pay for. A similar but less brutal insight into your habits lies beneath Aprico's "TV Digital Personal", a project for the German listings magazine TV Digital. The Aprico software allows users to create personalized TV channels, and builds on your preferences. There's a little bit of TiVo in there, but Aprico's Ned Wiley promised us it will be a lot smarter, and even adds on-demand suggestions. Like Infinite TV, if you're in the right demographic you might get free advertiser-funded content - such as a short music documentary produced and branded by Mercedes. UK viewers can see Aprico in action when Microsoft relaunches Vista Media Center next year, and Ned said they're in talks with Virgin. The Virgin Media interface could certainly do with a lift. And if you're wondering how these guys might know it's you watching TV, Austrian remote control developers Ruwido had one answer - a remote with a built-in fingerprint scanner. The Voco Media remote has just six buttons and may have been the most elegant thing at the show.